Last week we had some weather, with a couple of windy periods. and then some heavy rain showers. I'm going to start with the wind. Our new Richmond Beach station is doing a very nice job at recording our wind gusts. Below is the 24 hour graph of Sunday September 16th where we had a wind gust of 29mph. We had more wind overnight Friday into Saturday morning September 21-22, gusting up to 28mph. These winds came in behind a cold front that passed through Friday evening. In the wake of that same cold front Saturday afternoon, an unexpected development happened. An extremely strong Puget Sound Convergence Zone developed over Everett at about 3pm, producing a very heavy band of rain. 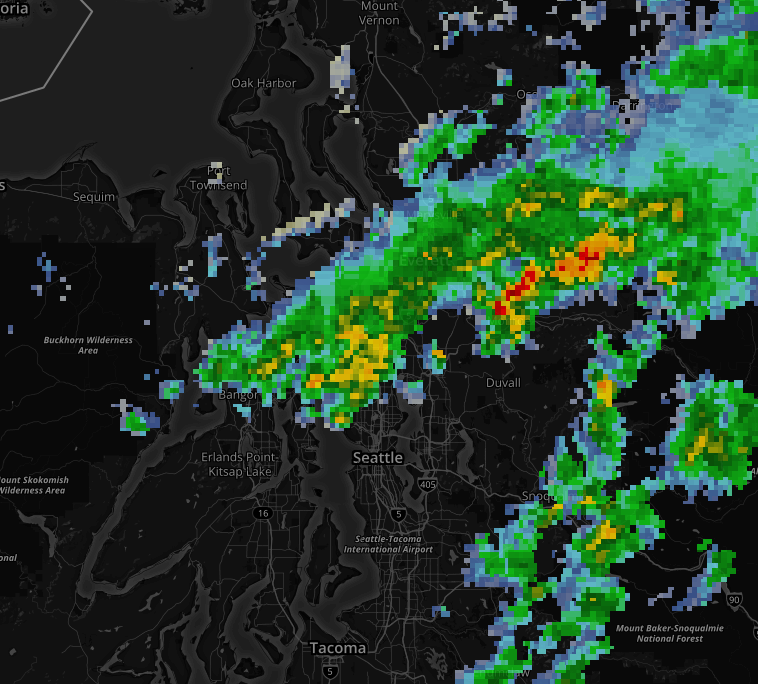 As the evening progressed this Convergence Zone event drifted south getting into Shoreline and Lake Forest Park. At the height of this Convergence Zone, cloud tops exceeded 30,000 feet and there were some lighting strikes in Snohomish County. In the image below you can see Seattle just south of the green and yellow blobs. Those yellow spots are centered over Shoreline and Lake Forest Park. The red spots north of Duvall are likely some of the lightening producing showers that we may have heard thunder from. 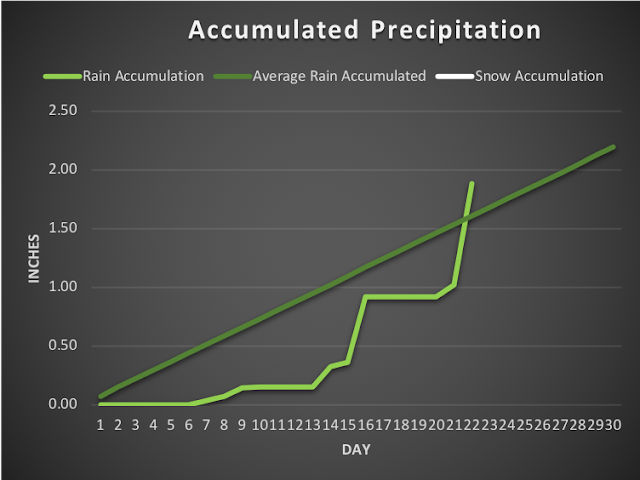 Everett received 1.63 inches of rain, while Shoreline near Richmond Beach received 1.05 inches of rain, and east in the Echo Lake neighborhood we received 0.83 inches of rain. The bulk of this rainfall occurred in about an hour and a half, starting at about 5:20pm and ending shortly after 7pm. This Convergence Zone was one of the more intense events I've witnessed here in the last 25 years. 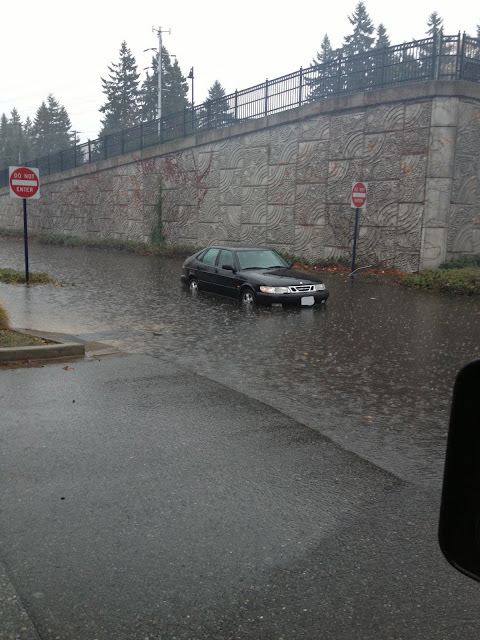 Sea-Tac, where official records are kept for the greater Seattle area, was not impacted by this heavy rain fall. September will likely go down as drier than normal for the rest of the region while we are right at about normal here. 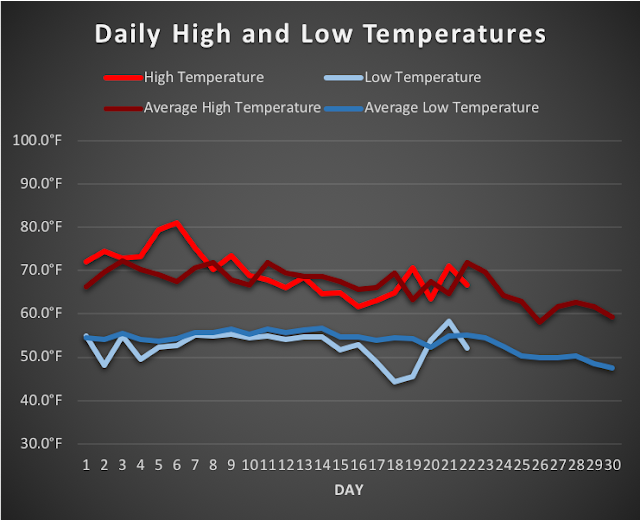 Temperatures remained at about normal if not slightly below normal last week as well. The remainder of the month may be slightly above normal so I expect that we will end the month at normal temperatures and normal rainfall by average. Forecast: Much calmer weather ahead as the upper atmosphere circulation switches into a stable blocking pattern, sending storms well north into Alaska. We are expecting to have sunny and clear skies all the way into next weekend where Saturday evening right now appears to have our next slim chance at any showers. Temperatures all week are expected to reach the upper 60's to low 70's with lows near 50°F.